If you’ve followed my blog for a while, you’ll know that I’ve been suffering with adult acne for a few years now. I’ve experimented with just about every type of skincare product/brand and it’s only recently that my skin has started to look exactly how I want it to. 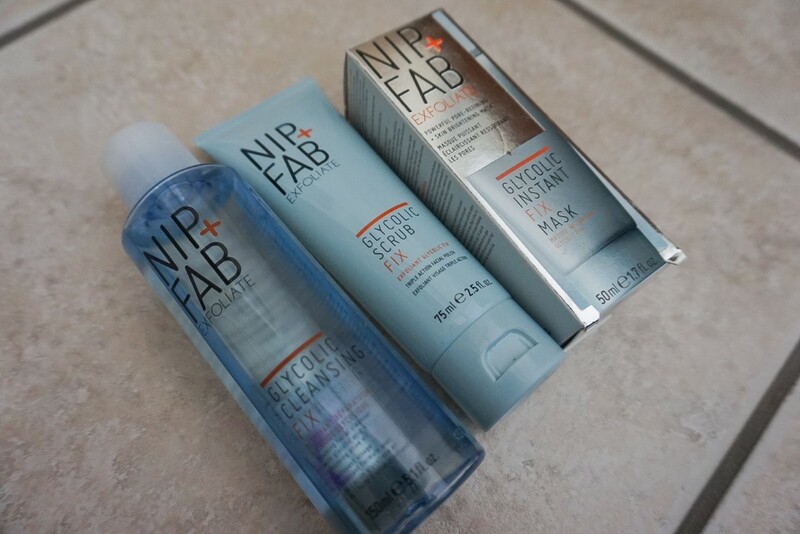 Granted, I get a few hormonal spots at a time, but my skin has never been smoother… and it’s all thanks to the Nip + Fab Glycolic range. This was the first product that I purchased from the range… and I instantly fell in love. The smooth consistency is really easy to apply – it takes a little while to lather-up, but works PERFECTLY with a spin-brush – and the product itself smells incredible. Although an acid-based, chemical formulation, I find this cleanser to be extremely gentle on my face – it doesn’t sting or burn, but awakens the skin quickly… which was a pleasant surprise. Best of all? My skin feels extremely soft and my pores look so much smaller after I’ve used this – it’s almost as if I’ve washed, toned and moisturised all at once! After getting on so well with the face wash, I had to invest in more products from the range – the two natural choices were the matching scrub and mask. The scrub is equally as impressive as the wash, with a matching scent and sugary-texture that gently, but firmly, removes dead skin from the face. In all honesty, I’ve never found a face scrub which left my skin feeling quite so refreshed and smooth before! This product was a little bit unexpected and at first, I wasn’t sure how to feel about it. As a stark contrast to the surprisingly soothing nature of the rest of this acid-based range, the mask has been designed to have a sharper, more abrasive approach to restoring the skins natural balance. Obviously, I didn’t realise this before putting the mask on and panicked that I’d suffered an allergic reaction when my face gradually turned red (as did many other users, by the look of the reviews I’ve read online). The good news is, this redness is natural… as is a slight tingling sensation. Once you’ve got past all of that, removed the mask and allowed the skin an hour or so to calm down, you’ll really be so impressed by how youthful and invigorated your skin looks! I also tested the Glycolic Serum (I bribed my boyfriend into purchasing this) and I’m going to buy that too! It flatters a layer of primer so nicely. For more product reviews, makeup looks and tutorials, please follow my blog today. I love Nip+Fab and was wandering about this range, thanks for posting about it, I’m definitely gunna get my hands on it. ← Does the Urban Decay ‘Distortion’ Glitter Liner live up to my expectations?